That being said, the HSA plan has seen a decent amount of growth over recent years, with the total number of HSAs nationwide increasing by over 329%. They are projected to grow close to $53 Billion by the end of 2018, while it was only a total of $5.5 Billion as of a decade ago. Why have we seen this growth? It’s mainly because healthcare costs have risen drastically, with the trend set to continue, at least for the foreseeable future. HSAs work in conjunction with high deductible health insurance plans, which are particularly popular for people with good health who are trying to limit their healthcare expenses. 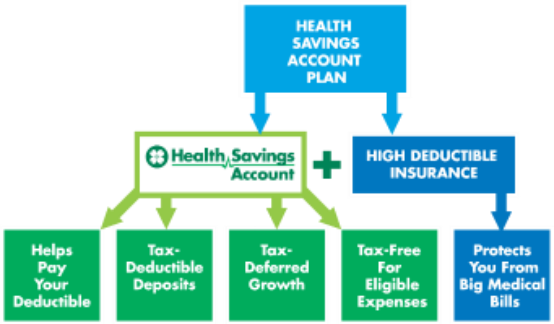 By utilizing premium savings from the high deductible insurance plans, HSAs can be funded with some or all of those extra savings; up to annual limits HSA contributions are also tax deductible. Obviously, this is a great option for some, but it’s not for everyone. If you have money to cover the deductible and/or want to divert premium savings elsewhere, this could be an attractive alternative option. With the ability to annually save up to $3,450 for single individuals and $6,850 for families, these HSAs grant savers the ability to efficiently set money aside for health expenses down the road, especially since those expenses are more than likely going to continue to rise over time. A full list of eligible medical expenses can be found at http://www.hsacenter.com/what-is-an-hsa/qualified-medical-expenses/ , but remember that the HSA may be more successful when allowed to continually grow over time very similarly to a retirement account. The idea behind using an HSA is very different than a Flexible Spending Account, where you are forced to utilize all of the funds within the account by year end (or shortly thereafter). Although the funds can be utilized in the same year they are contributed to the HSA, the goal would be to deposit funds into the HSA and invest them in order to hopefully outpace the growth in healthcare costs while also giving you the ability to help avoid taxes on all fronts. This example showcases very briefly the power that an HSA can have over time, versus just paying for something out of pocket later on in retirement. Example: John Doe is 35 years old and has decided to switch from a regular health plan to a high deductible plan in order to start funding an HSA for health expenses in retirement. If John Doe is single he is able to contribute $3,450 in 2018. If his marginal tax rate is 32%, then he saves himself $1,104 by not having to pay income tax on that money. If that money grows at a net rate of 6%, then at age 65 that one contribution would have grown to $19,815 and no taxes would have been charged on any investment sales within the account. If the money were in a taxable account, taxes would have been due each year on dividends and capital gains, as well as on the sale of the assets at retirement. This can make the HSA a more tax-efficient way to pay for healthcare expenses in retirement. Note that the above example only looked at a single year’s contribution to an HSA. By making contributions over many years, you could make a tremendous impact on the after-tax cost of your medical expenses later on in life, when you may be less able to pay the expenses out of pocket. In addition, some employers even make a portion of the contribution for you as an additional employee benefit. Finally, once you reach retirement age should you decide that you won’t need the money for medical expenses, it can be rolled over to an IRA tax-free. For more information on how to use these accounts to your benefit or for any other savings questions please feel free to reach out to the Financial Advisors at Capital Analysts of Jacksonville for a free consultation at 904-730-7433. Disclaimer: This content was developed from sources believed to be providing accurate information. The information in this material is not intended to provide legal or tax advice. You should consult your legal or tax advisor for information concerning your individual situation. Nothing contained herein should be construed as a recommendation to buy or sell any securities. As with all investments, past performance is no guarantee of future results. No person or system can predict the market. All investments are subject to risk, including the risk of principal loss. A plan of regular investing does not assure a profit or protect against loss in a declining market. You should consider your financial ability to continue your purchases over an extended period of time.